Most records are restricted to southern England south of a line connecting the Bristol Channel with the Wash. North of this area, a few recent records exist for Herefordshire and Anglesey whilst older ones are from Lincolnshire, Cheshire and South-west Yorkshire. The overall picture is of a southern thermophilic species, with a rather striking abruptness in its northern limits. It does not show the apparent increase in frequency in northern England exhibited by some other Ectemnius species in recent decades. However, Spooner (unpublished notes) suggests that its frequency within southern England has increased during the course of this century. Recent records exist for the Channel Islands (Jersey), but it is unknown from Ireland. Overseas distribution confined to Europe (but not the far north), and the Caucasus. Occurs in a variety of habitats but perhaps especially woodlands. Typically encountered around dead wood, timber and umbellifer flowers. Univoltine; June to September with a distinct peak in August and early September, which is somewhat later than other Ectemnius. Nest cells are stocked with medium-sized flies such as calypterates. This wasp nests in burrows in a variety of dead wood including tree stumps and fence posts. Umbellifers, especially wild angelica, also wild parsnip, hedge-parsley, hogweed and greater bumet-saxifrage. 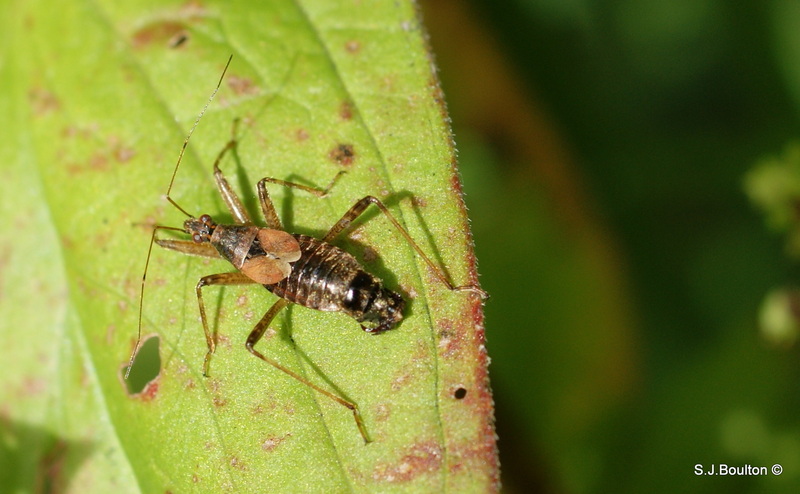 This genus has a black connexivum with orange-red spots, and rather reddish-brown wings. 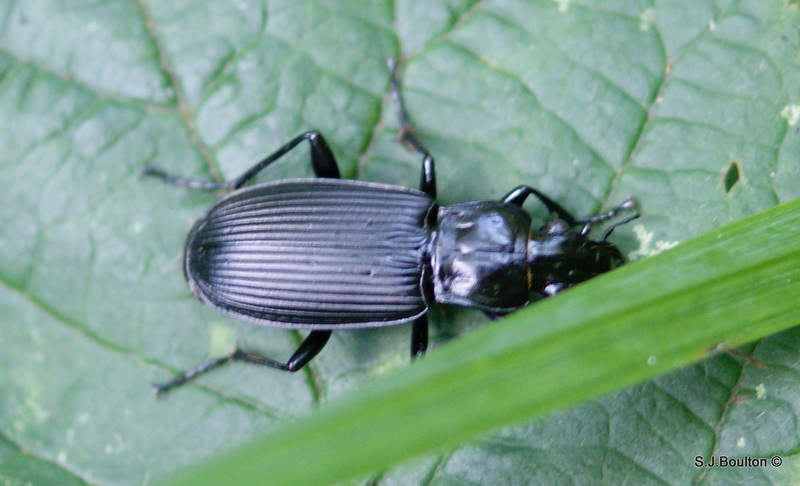 H. apterus is normally micropterous, the wings not reaching beyond the 3rd or 4th abdominal segment. 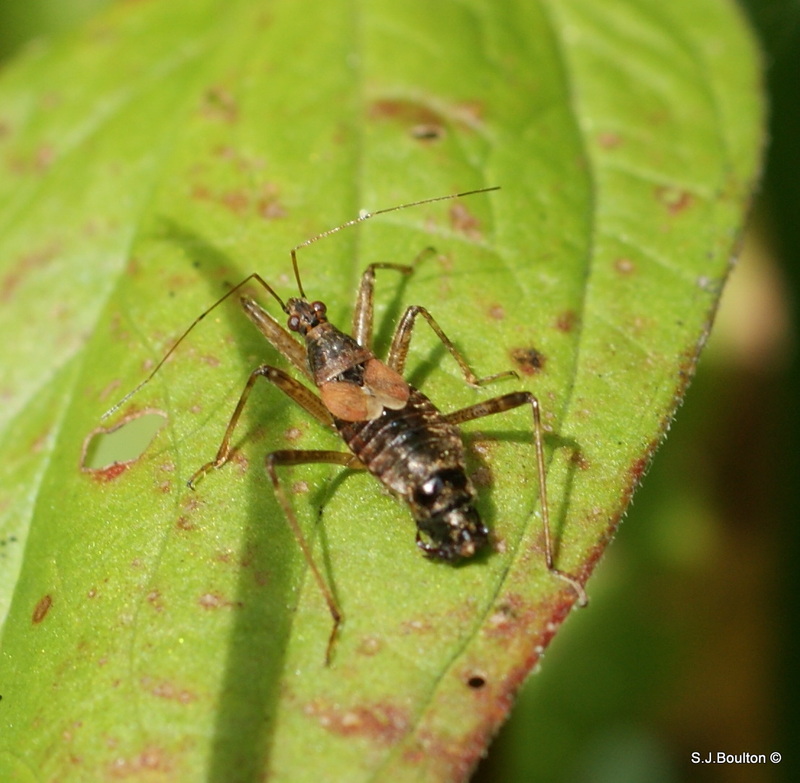 It is best separated from the smaller H. mirmicoides by the longer antennae (≥ length of thorax + abdomen), shorter wings and longer hairs on the hind tibiae (almost twice the width of the tibia itself). 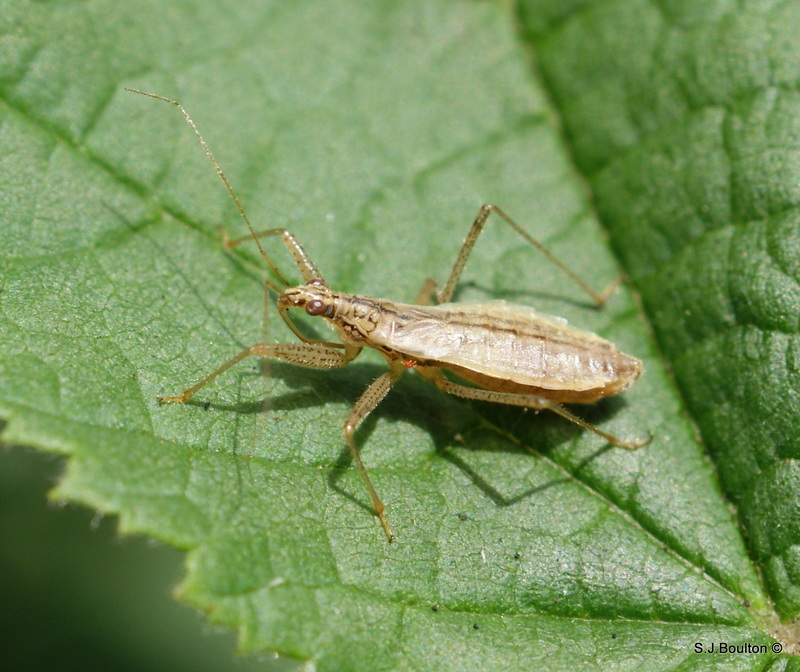 Unlike other UK nabids, this is a tree-dwelling bug, found on decidous species and less frequently on conifers, where it feeds on mites, aphids and other small insects. It is common in much of England and Wales, becoming scarcer further north. 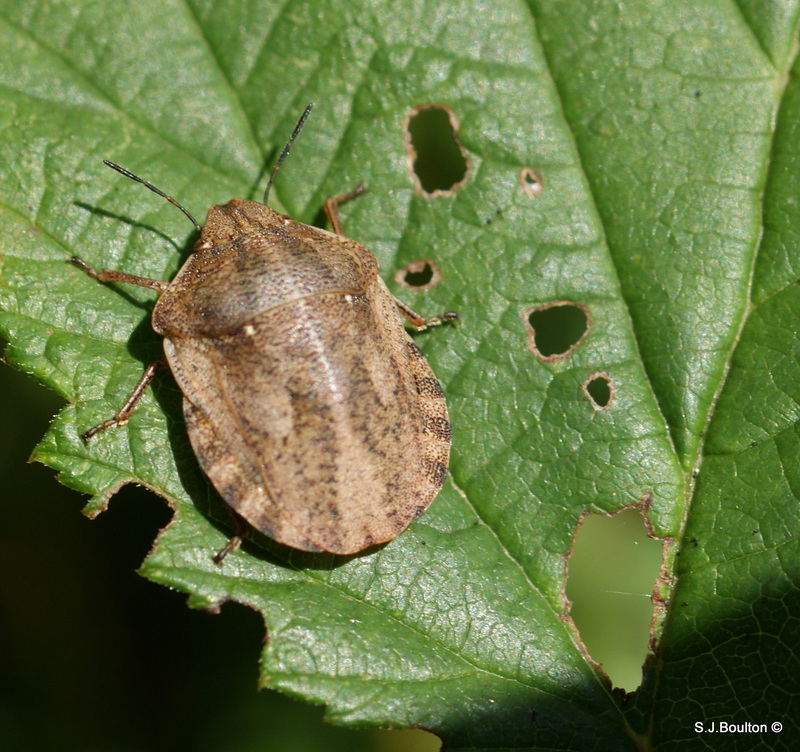 Adults lay eggs in late summer which hatch the following spring; larvae may be found May-August. The new adult generation is complete from July onwards. This species is almost always brachypterous, the forewings reaching the end of the abdomen, or stopping just short of it. Macropterous (fully-winged) specimens are much rarer, and may be confused with N. ferus, and particularly N. pseudoferus. 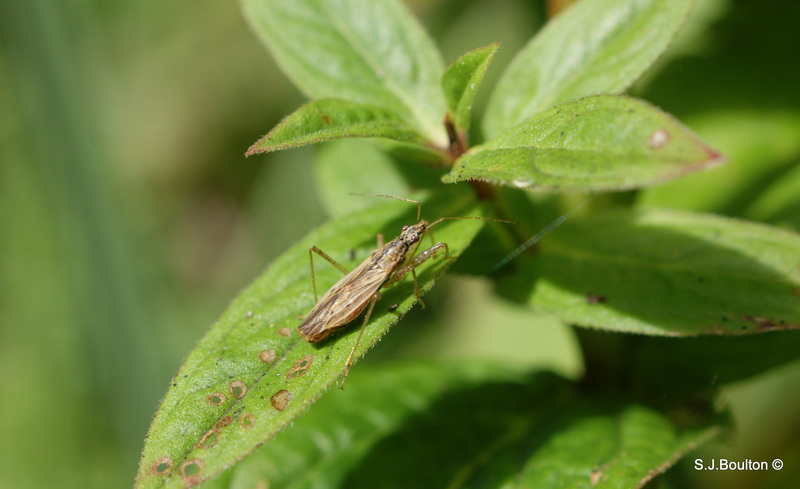 The length of the 2nd antennal segment is greater than the maximum width of the pronotum, further separating this species from N. ericetorum and also N. brevis, a much scarcer species confined to bogs and wet areas of heathland. N. brevis also has distinct dark areas on the anterior femora, in addition to the pattern of dots and lines. Adults overwinter, mating and egg-laying taking place in the spring. Larvae may be found June-September; the new generation of adults is complete from August onwards. If you look closely at the top of the middle leg on the photo below you will see a tiny blood sucking red mite. 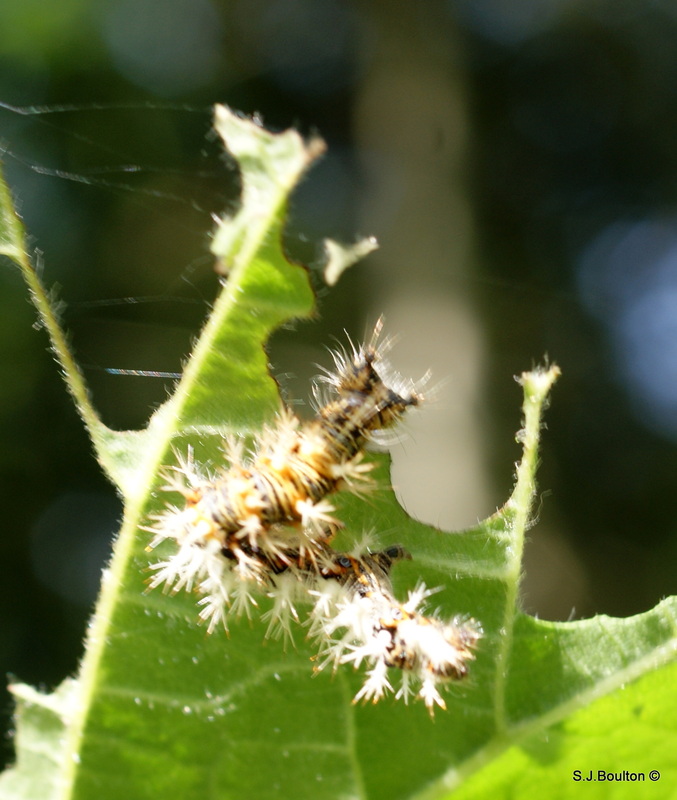 On emerging, the young larva moves to the underside of a leaf where it feeds. 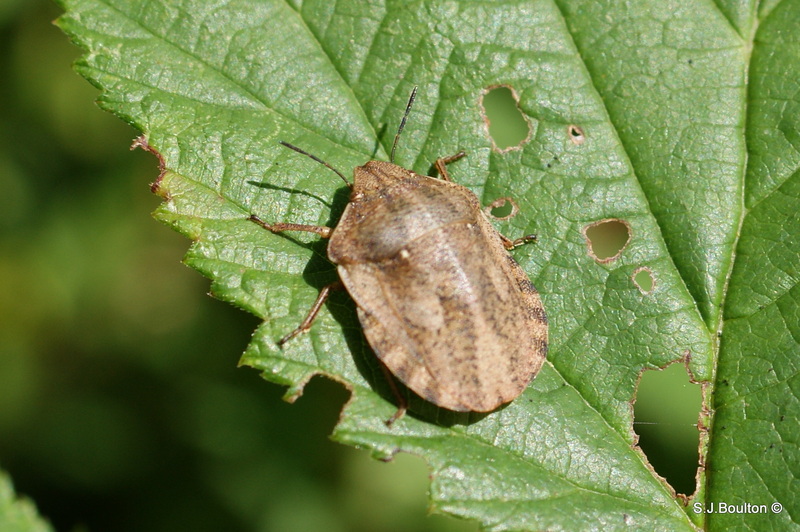 As it matures it feeds on the upperside of the leaf and is quite unmistakable, resembling a bird dropping. This stage lasts around 5 weeks, depending on temperature. Larvae of the first brood moult 4 while those of the second brood moult 3 times. A poor photo considering it didn’t move, but it was just out of reach. by the slight central depression at the front of the head and the slightly more protruding hind corners (‘shoulders’) of the pronotum. These characters are not always reliable; genitalic examination may be necessary. 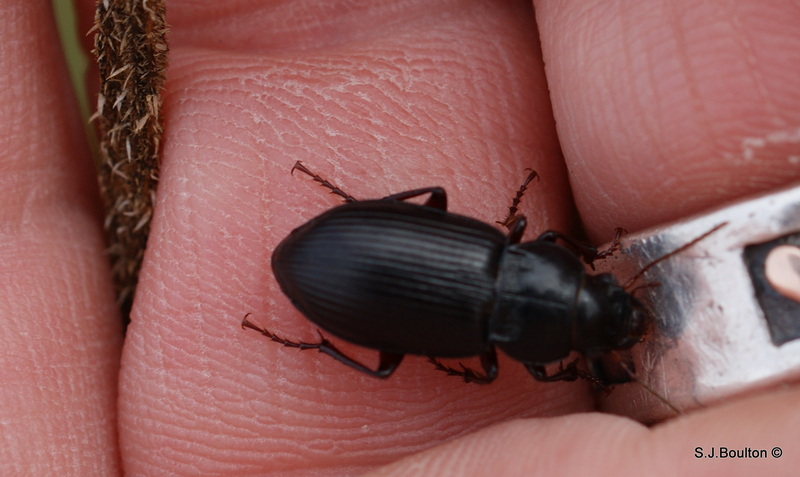 Females show a gap between the genital plate and the previous segment (often visible in the field with a hand lens), while the male aedaegus has 4 internal spines (requires dissection).